We offer a full range of garden hose reels for homeowners or for industrial applications as well. The water hose reel options include wall mounts, base mounts, or portable wheeled versions too. Hose capacities range between 125 to 350 feet depending on the model and style. Most reels accommodate standard 5/8” diameter hose but do not include the spray guns or garden hose. Select reels can accommodate larger 1” hose on request. See details below. All reels come with a leader hose to connect to the water source. We can provide garden hose fittings if you do not already have the needed adaptors but in most cases it is just as easy and screwing in the garden hose connection. 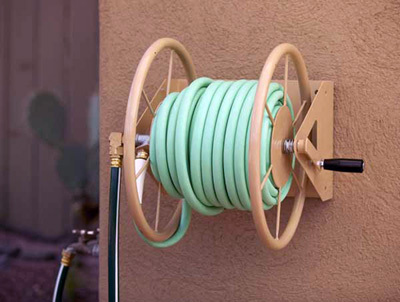 Garden hose reels provide and effective way to organize your hose, as well as keep it protected when not in use. 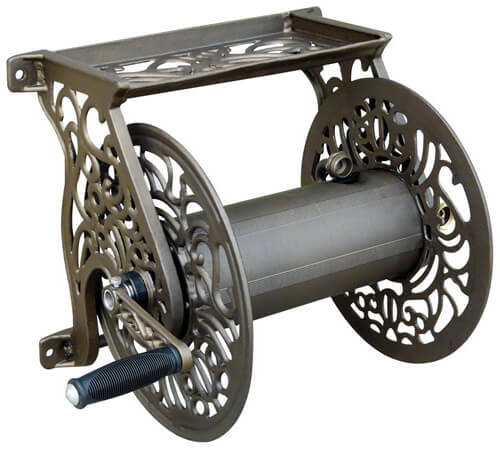 Durable 13 gauge steel assure long life from the reel, and a limited lifetime warranty indicates high quality construction. Of course, abuse, neglect, or misuse is not covered but proper maintenance and care will certainly allow extended life. We do also offer a full line of garden hose hangers if you prefer a simpler or more cost effective way of keep your garden hose neat. 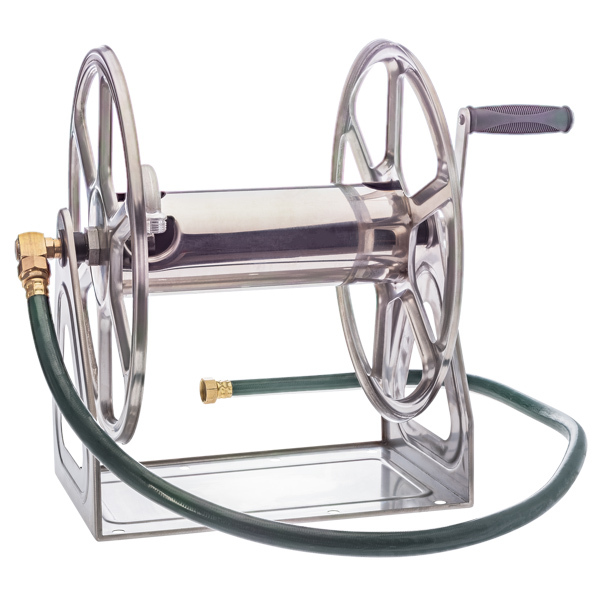 * Stainless Steel garden hose reels are limited production item; lead time is 2-3 weeks. For sanitary or harsh environments, these reels are invaluable for food and beverage industry, dairy, pharmaceutical, and cosmetics industries due to their resistance to rust and corrosion and absence of paint that can chip. They have numerous uses too for the marine industries in offshore settings. 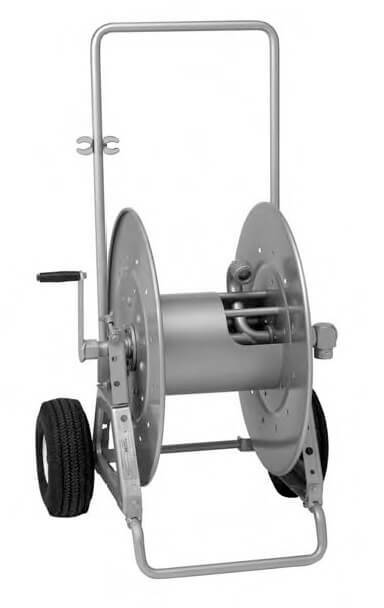 Reels are constructed of 304 stainless steel frames, discs, drums, and internals. These versatile multi-purose hose reels are heavy-duty, solid wall mounted reels that also anchors to lawn or turf or add the rubber boots for a nonskid floor mount. Made of tough 13 Gauge steel with industrial strength powder coated finish, this is one unit that will suit a variety of your hose reel needs. 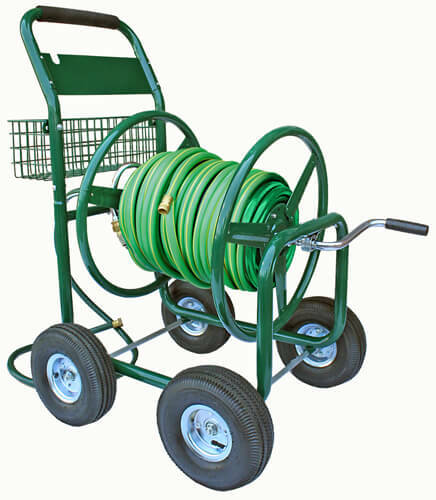 These versatile Garden Hose Reels are heavy-duty, solid wall mounted reels that also anchors to lawn or turf or add the rubber boots for a nonskid floor mount just like the previous model. Made of tough 13 Gauge stainless steel. 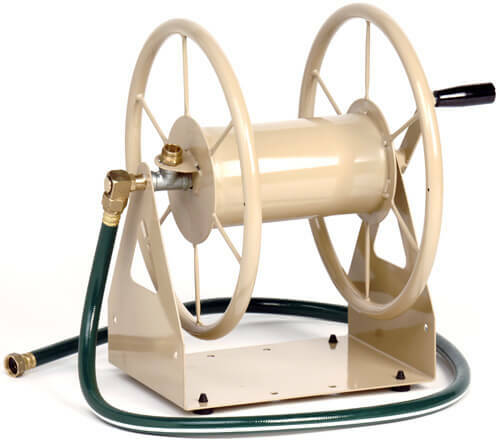 The Decorative Wall Mounted Hose Reel is made of all non-rust, Cast Aluminum with brass plumbing fixtures and a durable powder coat finish. This decorative unit easily secures to home or wall. 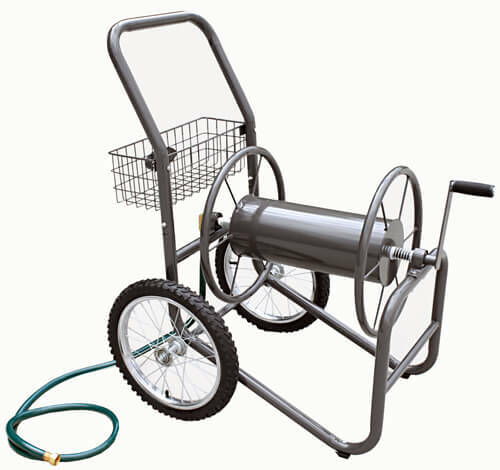 This Top-of-the-Line, Industrial/ Commercial Grade hose reel cart is sure to make you watering projects easy and quick. 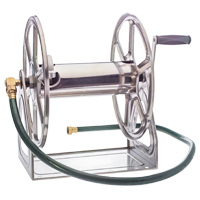 Features a smooth reel that lets you pull out as much hose as needed, then easily winds back. 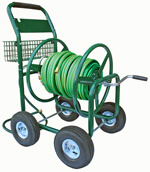 This Top-of-the-Line, Industrial/ Commercial Grade hose reel cart can accommodate 1” garden hose up to 200’. 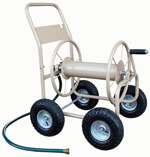 Choose this model of water hose reel for great stability with a 4 wheel cart designed to hold 300 FT of garden hose. 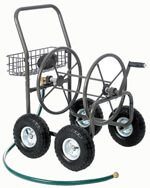 This versatile Four Wheel Hose Reel Cart features a tough, lightweight 1-1/2" steel frame set on four pneumatic tires for a sturdy support base with great manoeuverability. Perfect for all home, farm, ranch and commercial uses. The industrial grade finish is also weather/rust resistant. This versatile Four Wheel Hose Reel Cart features a tough, lightweight 1-1/2" steel frame set on four pneumatic tires for a sturdy support base with great manoeuverability. Model has largest capacity we offer at 350 FT. Mounted on a green powder coated frame with 4 pneumatic tires. Premium garden hose spray guns, with adjustable brass tip with brass plunger and nut. Zinc alloy body and comfortable soft grip. Your source heavy-duty garden hoses for easy and effortless work. 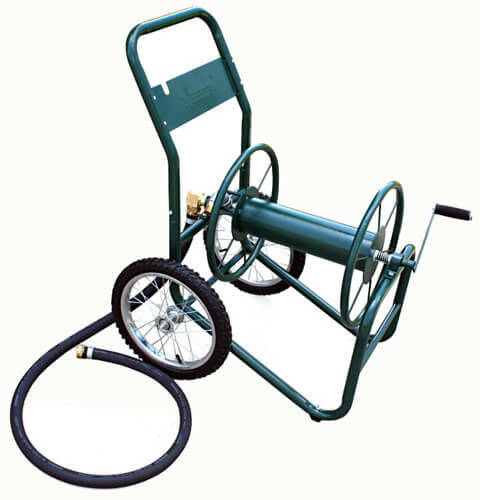 Find garden hoses for professionals and pressure washing contractors. Available colors in red and light green.